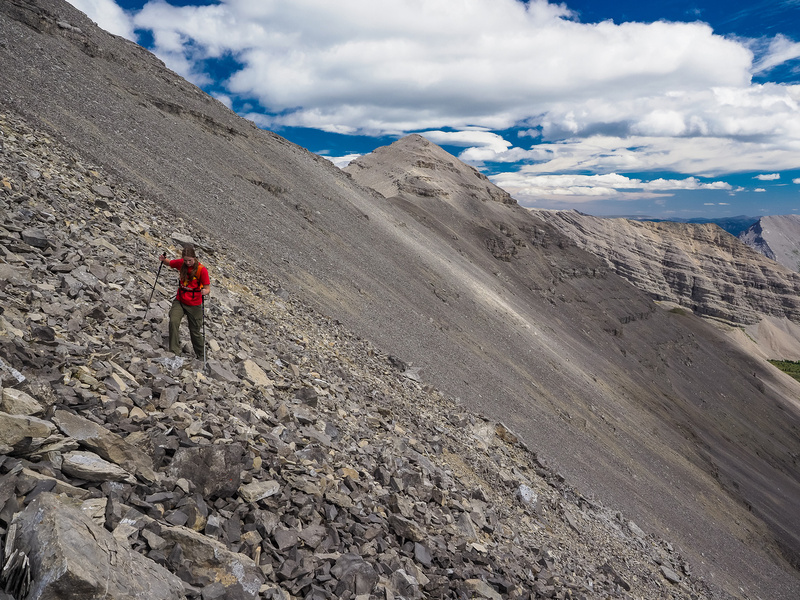 Difficulty Notes: The most difficult part is the chained section to Carnarvon Lake. After that the most difficult part is looking at the true summit from the false one. 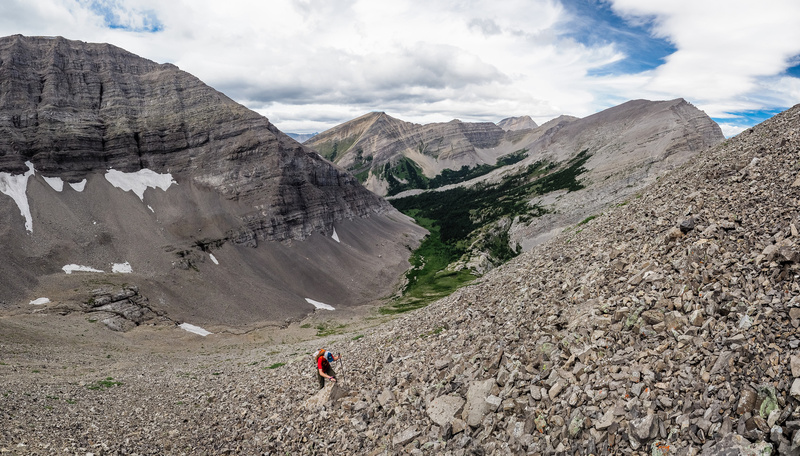 Note: Distance and elevation gain includes an ascent of Mount Shankland and is measured from Carnarvon Lake. Mount MacLaren and Shankland Route Map from Carnarvon Lake. Looking back down at the valley between MacLaren and Strachan, which is rising in the distance to the right. The ridge running from left to the center of the photo is the alternate descent ridge for Shankland. 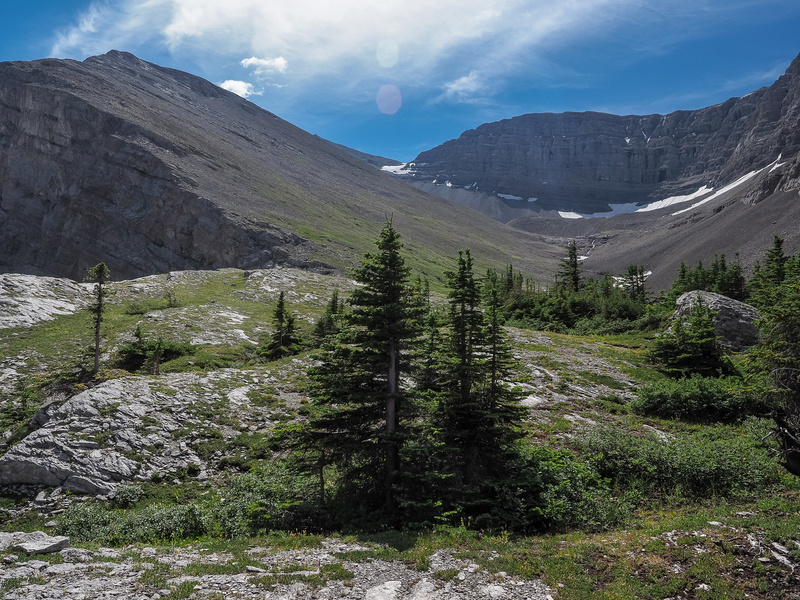 The route up MacLaren started straight out of our tent and soon we were grunting up grass and scree on the lower part of the ridge above Carnarvon Lake. It was hot and it was windy. It felt wonderful to have light packs on. I was carrying a bunch of water since there was no guarantee of snow melt on the dry traverse we’d be doing. 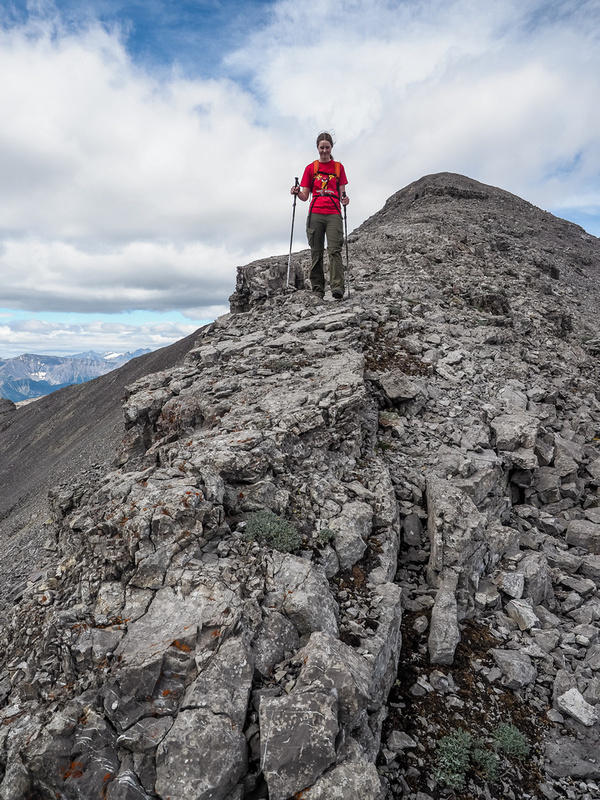 Thankfully we had no smoke issues with our views either and soon we were grinding up the final scree slope beneath the first (false) summit of MacLaren. The views east and north off the ridge were fabulous. 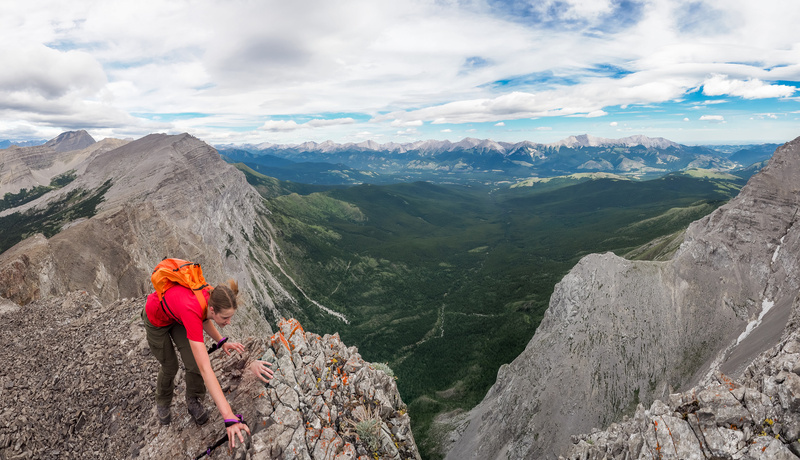 We could also enjoy as much or as little exposure over the east face as we were comfortable with. Gorgeous views south to the true summit and the lovely valley between MacLaren, Armstrong and Bolton. I’m not gonna lie. The view of the true summit from the false one was a wee bit depressing. We’d already had a long day and this certainly didn’t help make it any shorter. There was nothing to do but lose some height and regain it to the true summit. Views throughout the easy scramble between summits were very acceptable, now looking towards the surprisingly lofty foursome of Courcelette, Aldridge, Cornwell and Baril – all at near 3,000m high. 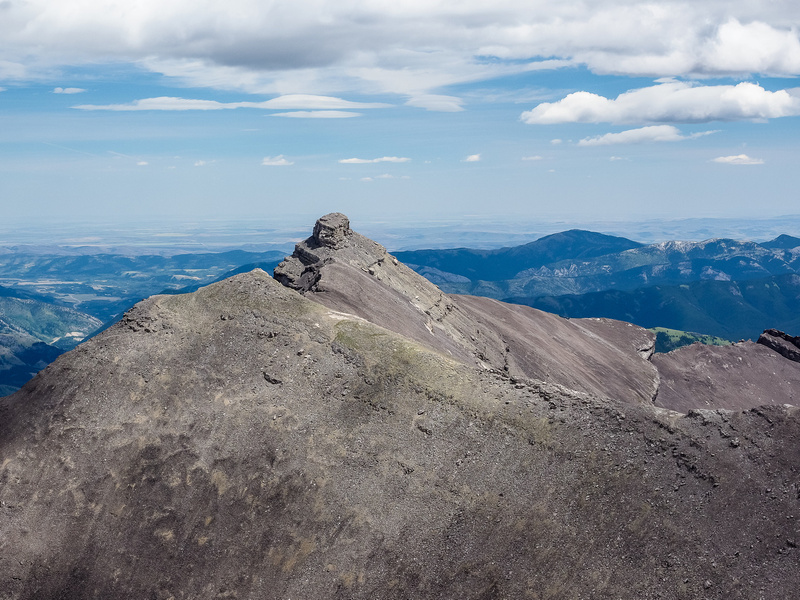 We also gave some nervous glances over at the intervening ridge / summit between the false peak of MacLaren and the false peak of Shankland. The terrain there didn’t look that easy. From L to R, Baril, Cornwell, Aldridge, Courcelette with Bolton in the foreground and Veits at far right. 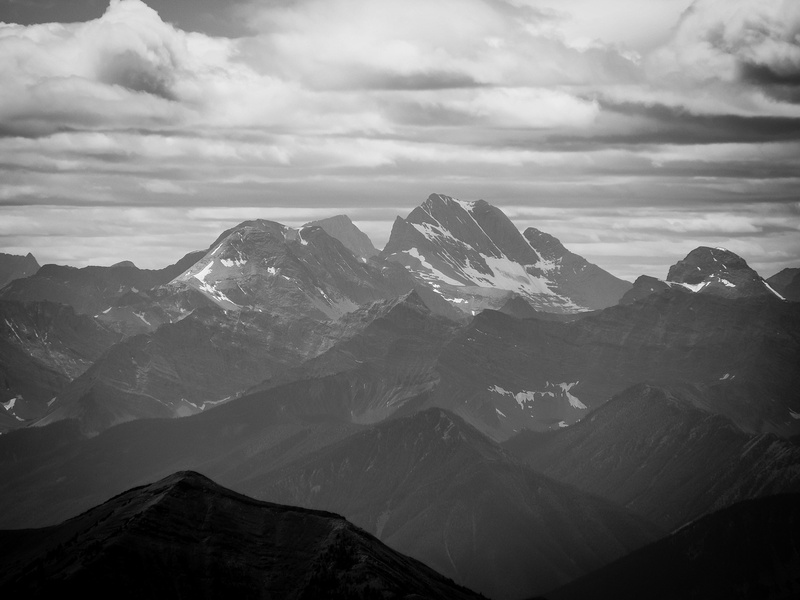 Pretty darn sweet views north (L), east (C) and south (R) off the summit of Mount MacLaren. No smoke today! 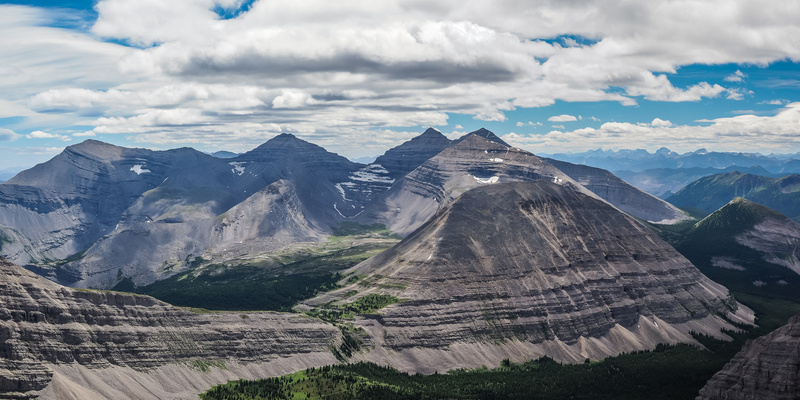 Another view over the lush Highwood River Valley and Hwy 40 towards the Highwood Range at peaks including Serendipity, Patterson’s and Lineham Peaks. 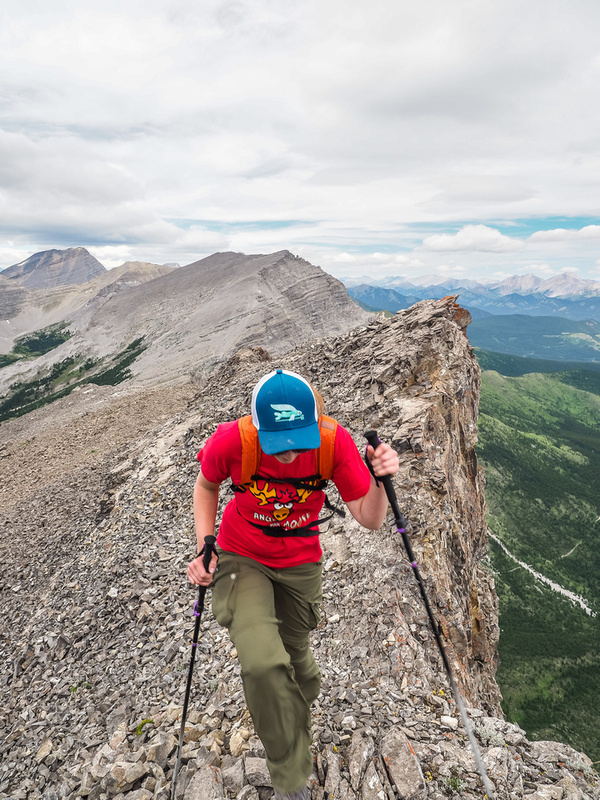 The summit views were pretty sweet from MacLaren, including many of the Kananaskis peaks I’ve stood on like Holy Cross, Head, Gunnery and even all the way to the Highwood Pass with lofty summits like Rae and Mist showing up. After enjoying a break we started back down to the col with the false summit. From the col with the false summit we made a decision to side-hill towards the first summit along the traverse towards Mount Shankland. On hindsight, re-ascending the false summit of MacLaren would probably have been easier and even quicker but we were trying to save our poor legs. 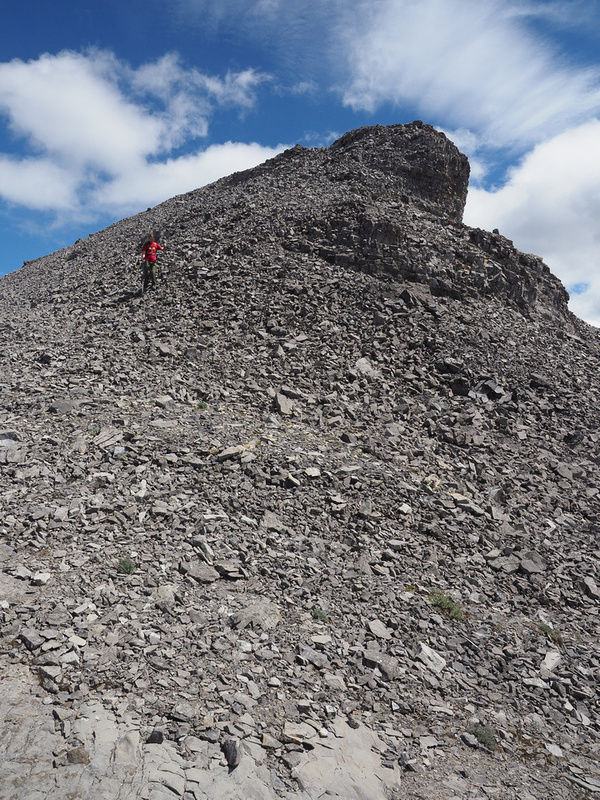 Soon we were at the col with the first bump and the false summit of MacLaren. Little did we know how much work was still ahead of us as we started up. 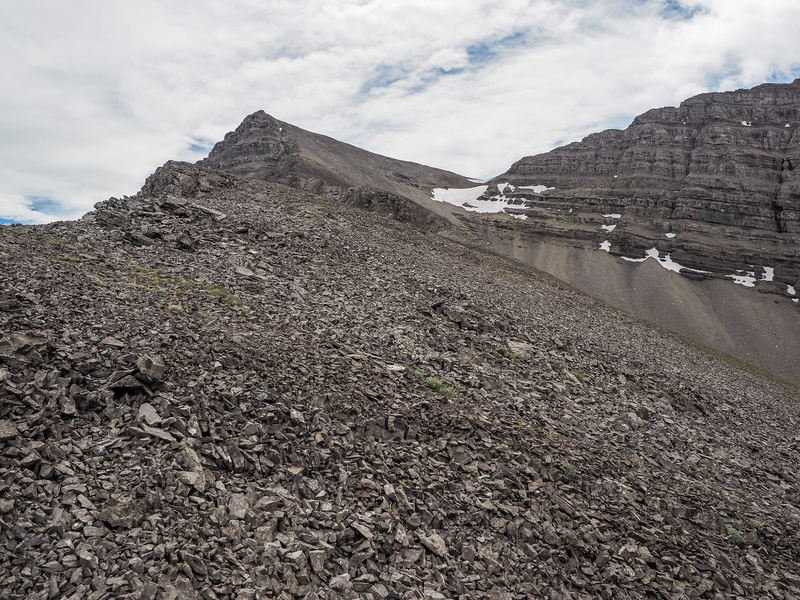 Looking up towards the false summit of MacLaren from just above the headwall behind our tent - the lake is out of sight at lower left here. 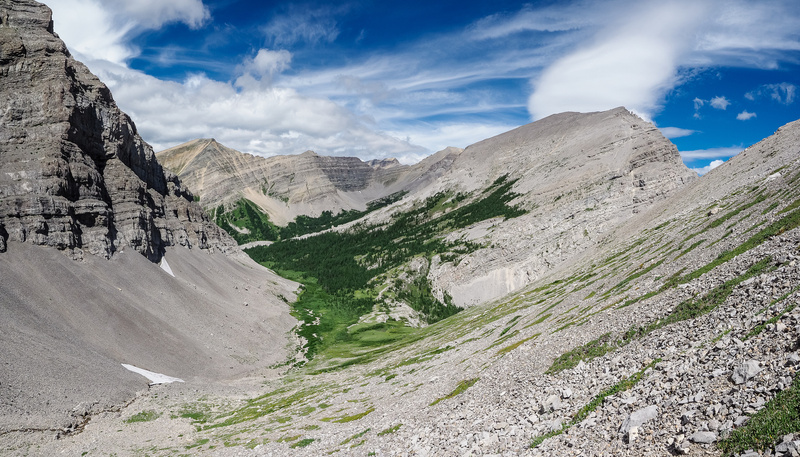 Carnarvon Lake is stunning from above the headwall. Looking back down at the valley between MacLaren and Strachan, which is rising in the distance to the right. On the NW ridge of MacLaren now, looking north towards Strachan, McPhail (C) and Muir SW2 (L). Still a long way to the false summit from here - but easy and with great views. Don't blow off the ridge KC!! KC deals with strong wind gusts on the exposed (but easy) ridge. You can see the first false summit of Shankland now at left. Muir, McPhail and Strachan at distant right. 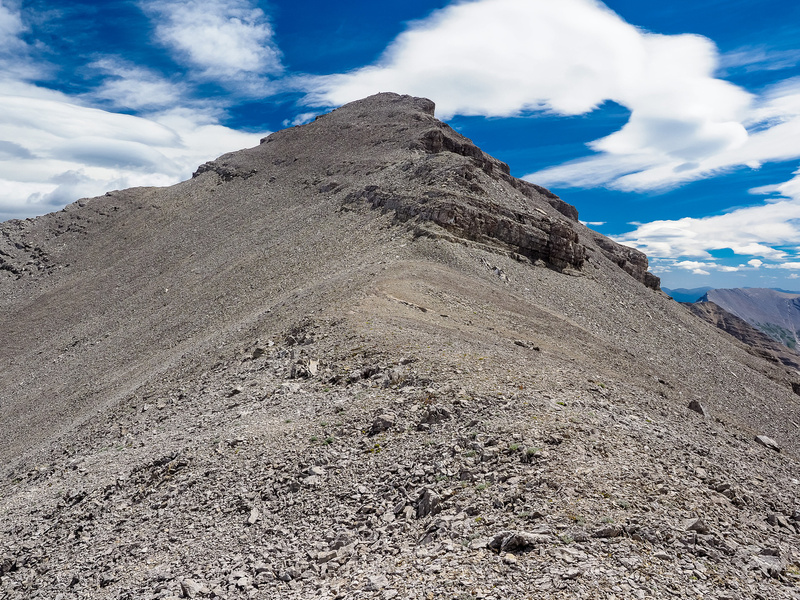 This striking peak to the east of the summit of MacLaren is unnamed as far as I can tell. 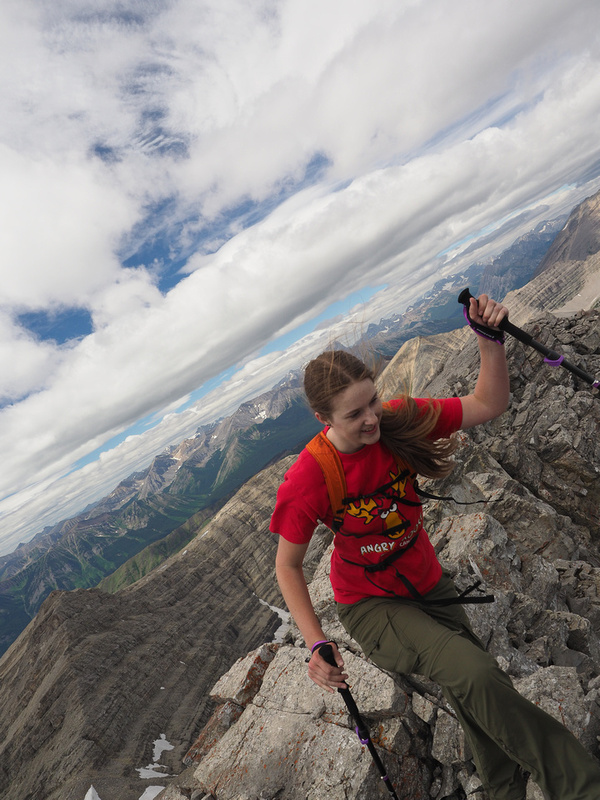 KC descends the easy ridge from the false summit of MacLaren. 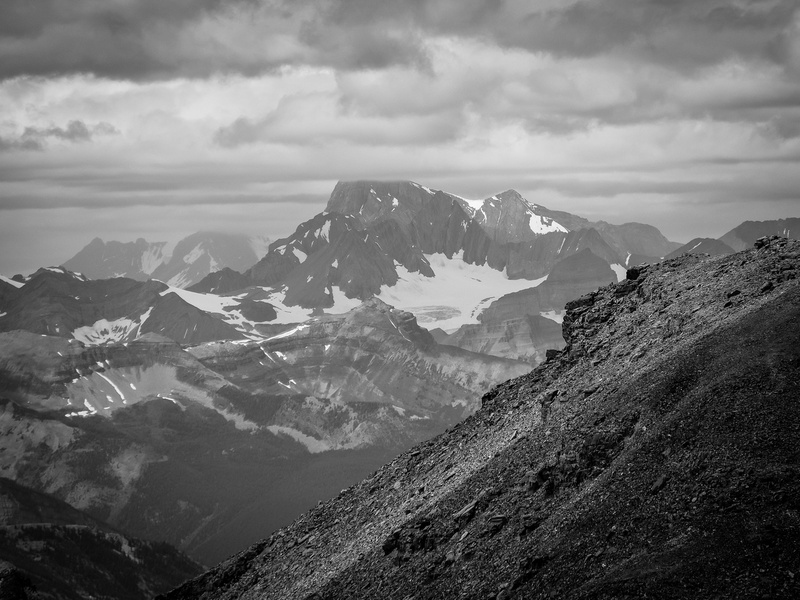 The true summit of MacLaren from the col. Note the two false summits of Shankland across the tarn at left and center. 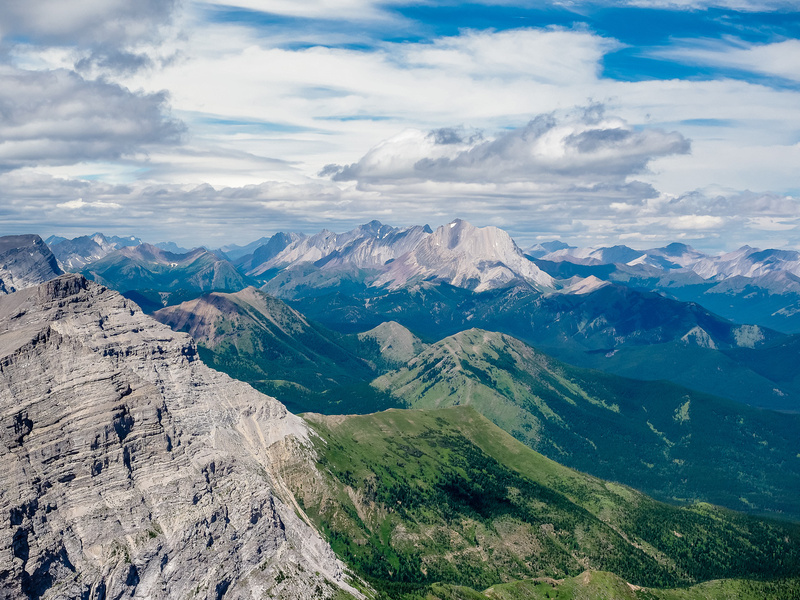 Pretty darn sweet views north (L), east (C) and south (R) off the summit of Mount MacLaren. Bolton (L) with Courcelette, Aldridge, Cornwell and Baril (L) and Shankland's false summits at center. L to R, Baril, Cornwell, Aldridge, Courcelette with Bolton in the foreground and Veits at far right. 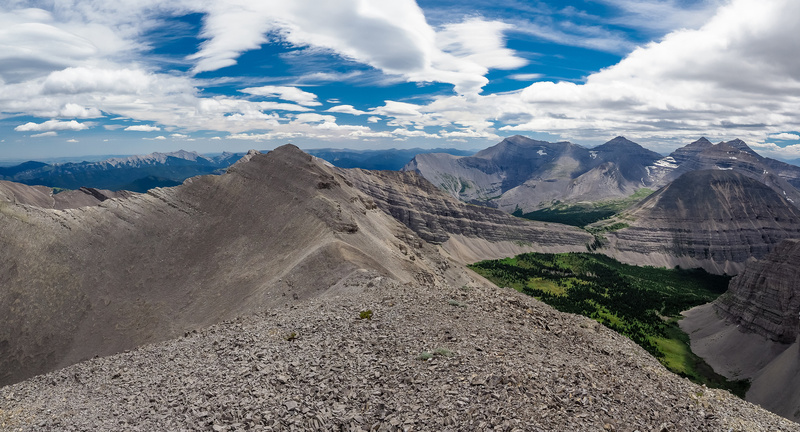 A pano looking west includes Harrison at left and Abruzzi at right. Looking north, back over the false summit with McPhail rising impressively at distant right. Abruzzi rising at left and Joffre at center distance. Looking towards Highwood Pass at Mist Mountain with Mount Rae just left of it. Looking towards Mount Head and Holy Cross. Another view over the lush Highwood River Valley and Hwy 40 towards the Highwood Range at peaks including Serendipity, Patterson's and Lineham Peaks. 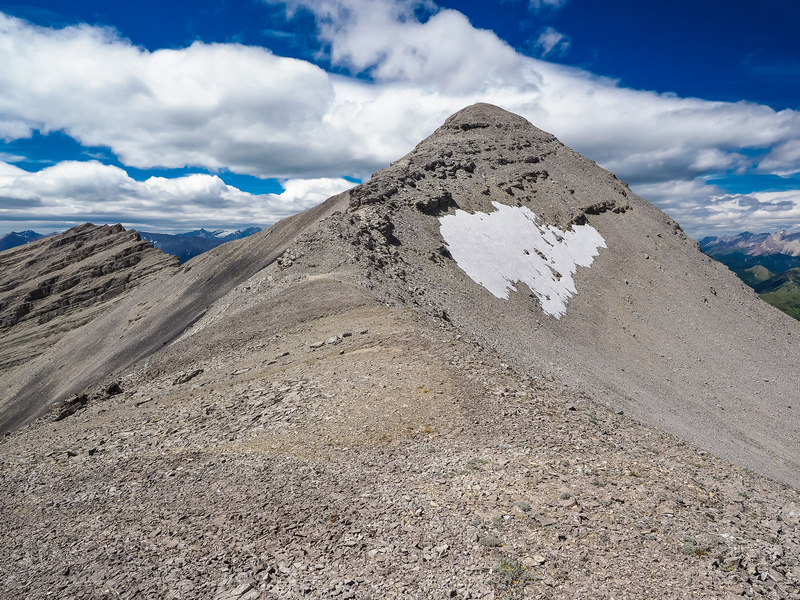 Mount Harrison - the southernmost 11,000er in the Rockies. 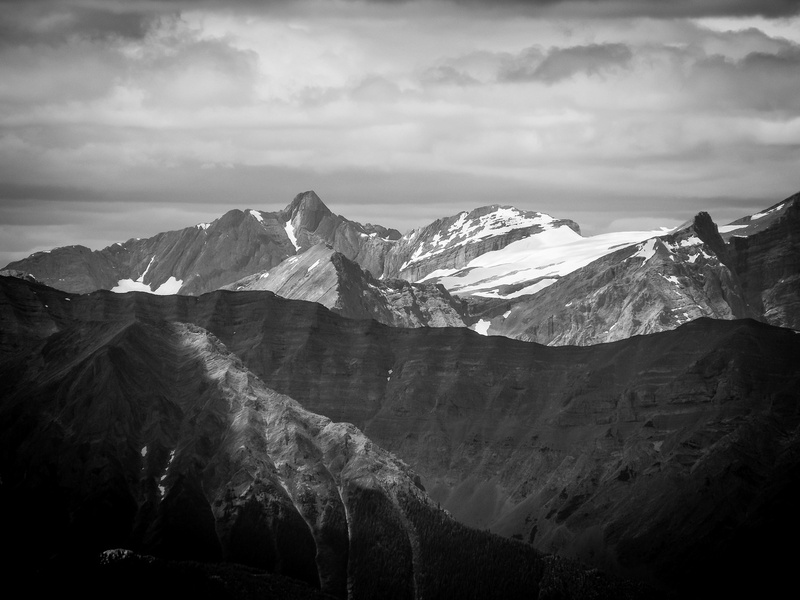 Mount Joffre with Nivelle and the Elk Glacier in the foreground. 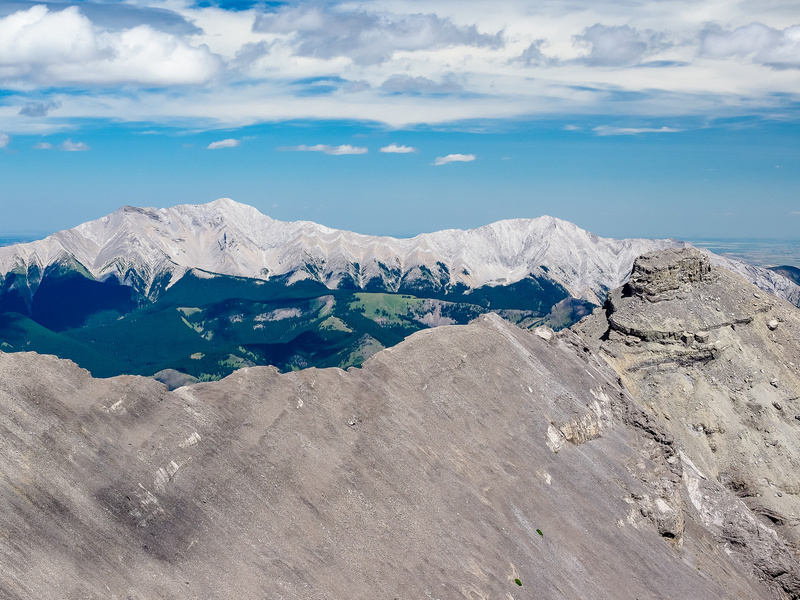 Impressive peaks to the NW include Mount Cadorna, Battisti and Stilleto Peak. Mount Lancaster just left of center and Connor just right of center. 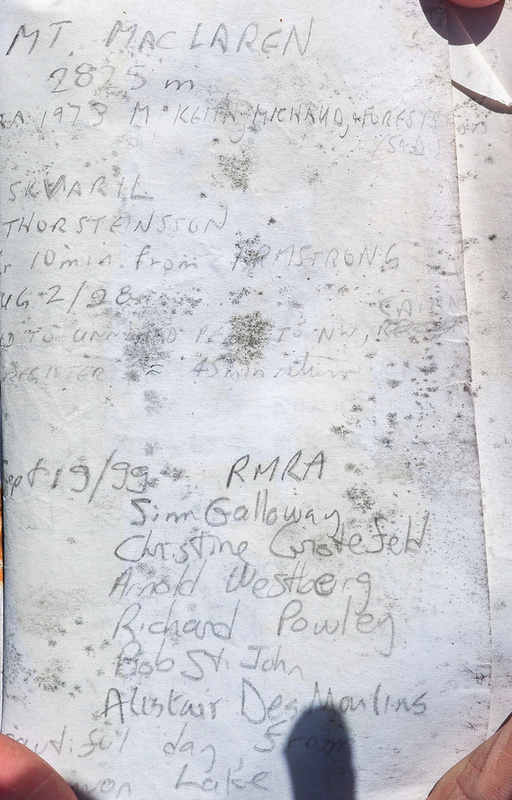 An old register with surprisingly few names. But it was well hidden so I think some summit parties have missed signing it over the years. Starting our descent as the gorgeous tarn between MacLaren and Shankland catches sunlight. Rather than re-ascend the false summit of MacLaren, we choose to side-hill to the col at left. 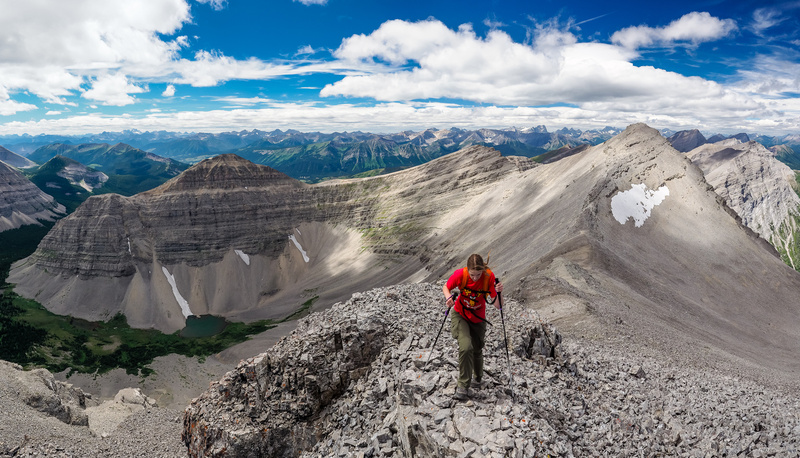 KC grinds her way along the side-hill traverse from MacLaren (in the bg) towards the first false summit of Shankland. MacLaren at left with the tarn and two false summits of Shankland at center and right.